How much will a new Meetup app clone cost? A few weeks earlier we wrote a blog how much will a new split wise app cost to make? The goal was to help startup wannabes understand the actual cost of building a new mobile app from scratch. While most people are fascinated by ‘cool’ logo or exciting ‘interface,’ they tend to forget the logics behind the application or the so called- backend. Why does this come first? Because before you start discussing <what will happen in the app/how the backend will work>, you need to consider how will it help people. Why is there a need for your app? A real need, not an imagined one. Today, there are hundreds, if not thousands, of online marketplace apps that connect buyers to sellers, consumers to service providers, business owners to industry vendors so on and so forth. A very similar idea started with ‘Meet Up’ that connects event organizers to interested candidates. The beauty of the app lies in the fact that you could be just about anyone yet you can create or join any event in your city. This location-based app underwent a major design overhaul late last year, including the Meetup swarm logo. Several other features on the mobile UI saw changes while the web version stuck to its core design with fewer changes. However, if you were to develop a new meet up app from scratch, it would cost you a bomb. Let’s look at at the existing features a little bit closely. The first and the most obvious question then, is– what is meet up? Meetup is a location-based marketplace that facilitates offline group meeting and lets people form groups based on their mutual interest such as politics, books, games, movies, career or other hobbies. That’s the one-liner. Underneath is whole different story. The story of how one user would register, login, selects city and chooses his interests. He has an enormous list of close by, filtered groups to join. The user can join one or multiple groups. On the other hand, a user can create a new group by setting up location, tagging industry or category, adding description & image, selecting status (open/closed), fixing event fees if any and many more customizations that Meetup currently allows. Behind the scenes, sorting events by category, date, distance and user preference happens seamlessly. So how many hours of development would it take? Care to find out? 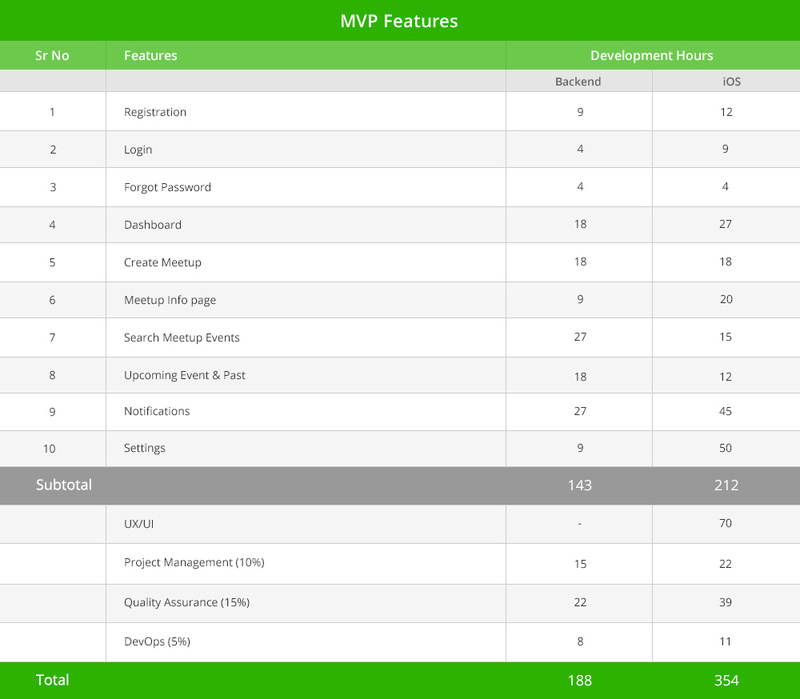 542 hours is a little less than 4 months of development work for the MVP, but that does not cover many additional features. Also, think about scalability. Almost equal efforts will go into designing and developing the Android version and the web portal. One could wonder why a web platform, but think about your users when they are creating and managing a group or event. Selecting filters as well as managing existing member would be much easier on the bigger screen when all additional functions/filters get listed out instead of being taps away from each other. Thus web platform would make for a better user experience. Within Meetup, it’s hard to segregate the necessary features versus the add-ons as all the features are tangled together. For example ‘search’ functionality is core to the app for users to join the group. However ‘advanced search’ with filters like sorting by number of members, date of formation or technology subcategory are built add-ons to the core. They serve to improve user search experience and help them navigate the 100’s of groups with ease. Each of these involves intricacies in development. Taking the development timeline to 2000 hours. Let’s see how. 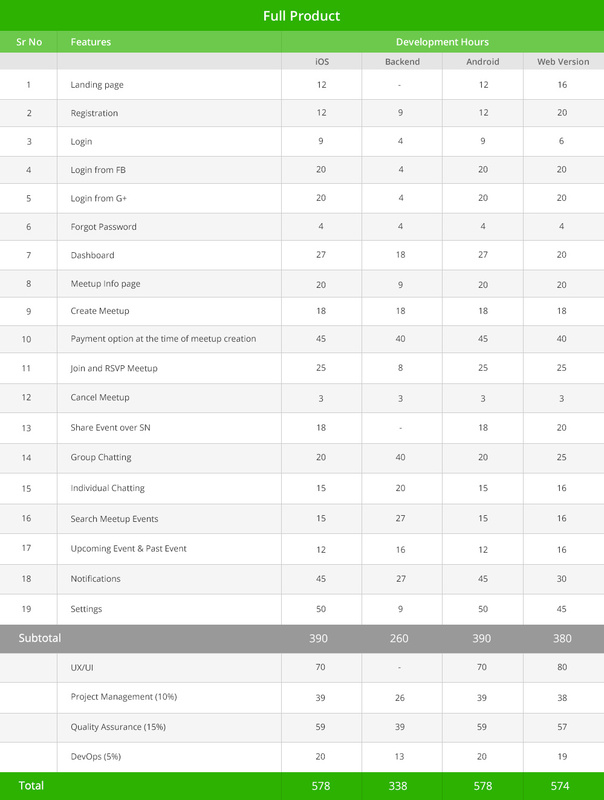 This table talks of high-level estimates from our expert iOS, Android, and back-end developers. The additional markups for QA, project management, and deployment are standard to most IT projects. At Galaxy, we know difference between ‘almost ready’ and ready. We estimate work as acutely as possible so that our clients are in the know-how of what is happening and how much will it cost. Depending on where your developer/team is located your total cost for the project could vary. Average hourly cost starts as low as $15 in India and could range up to $250 an hour for experienced resources in North America. With this wide a spectrum it is never easy to define worth? So do your homework before you get bitten by cheap but shady development. As President Abraham Lincoln once said ‘Give me six hours to chop down a tree, and I will spend the first four sharpening the ax.’ Our team will spend the time to detail down your requirements rather than harp the bassoon of low cost.